The DS1904 RTC iButton® is a rugged real-time clock module that can be accessed with minimal hardware. Data is transferred serially by the 1-Wire® protocol, which requires only a single data lead and a ground return. The DS1904 contains a unique 64-bit factory-lasered ROM and a real-time clock/calendar implemented as a binary counter. The durable MicroCan® package is highly resistant to environmental hazards such as dirt, moisture, and shock. Accessories permit the DS1904 to be mounted on almost any surface including printed circuit boards and plastic key fobs. The DS1904 adds functions such as calendar, time and date stamp, stopwatch, hour meter, interval timer, and logbook to any type of electronic device or embedded application that uses a microcontroller. 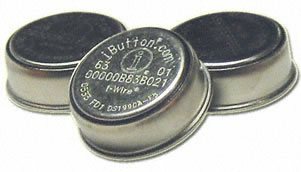 Q: Following are the specification for the i Button I am looking for: 0000006E8F9C i wire 0550-LCI DS 1994L-F5 Could you please, let me know, if you have this particular kind of iButton? Thanks in advance for your help! A: Thank you for the inquiry. We do offer the iButton model you want. It is the DS1994L-F5+. The DS1994L is very similar to this model, but the DS1994L also have 4Kb of general purpose memory.